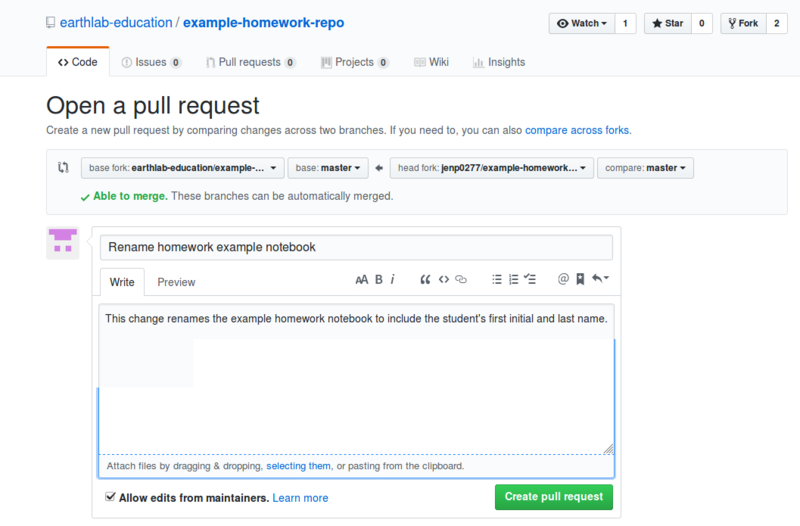 In this lesson, you will learn how to submit a pull request to suggest that your edits be included in another repository (e.g. the original repository from which you forked and cloned a repository). Specifcally, you will practice submitting a pull request for your updated Jupyter Notebook for Homework 1. Be sure that you have also completed the Guided Activity on Version Control with Git/GitHub. In the Guided Activity on Version Control with Git/GitHub, you added, committed, and pushed changed files to your forked repository on https://github.com/yourusername/ea-bootcamp-hw-1-yourusername. To submit changed files to the original repository owned by earthlab-education (https://github.com/earthlab-education/ea-bootcamp-hw-1-yourusername), you need to submit a pull request on Github.com. 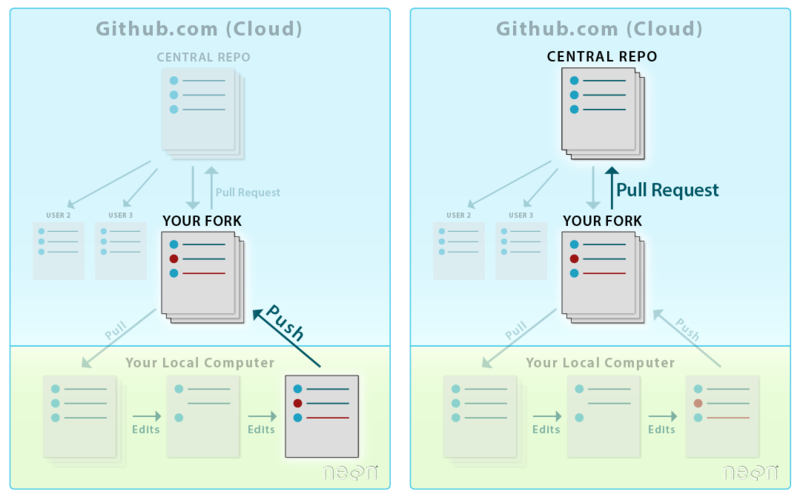 LEFT: To sync changes made and committed locally on your computer to your Github account, you push the changes from your computer to your fork on GitHub. RIGHT: To suggest changes to another repository, you submit a Pull Request to update the central repository. Source: Colin Williams, NEON. Pull requests inform the owner of the original repository (e.g. https://github.com/earthlab-education/ea-bootcamp-hw-1-yourusername) that you have changed files you would like to add from a forked repository (e.g. https://github.com/yourusername/ea-bootcamp-hw-1-yourusername). It allows you to contribute to another repo without needing administrative privileges to make changes to the repository. It allows others to review your changes and suggest corrections, additions, edits, etc. It allows repository administrators control over what gets added to their project repo. The ability to suggest changes to ANY repository, without needing administrative privileges is a powerful feature of GitHub. You can make as many changes as you want in your fork, and then suggest that the owner of the original repository incorporate those changes using a pull request. Pull requests are the heart of collaboration on Github.com. When you open a pull request, you’re proposing your changes and requesting that someone review and pull in your contribution and merge them into their project. To begin a pull request (PR), click the New pull request button on the main page of your forked repository (e.g. https://github.com/yourusername/ea-bootcamp-hw-1-yourusername). Location of the New pull request button on the main page of an example repository for jenp0277. Data Tip: You can also click the “Pull Requests” tab at the top of the main page of a repository to submit a pull request (PR). When the pull request page opens, click the “New pull request” button to initiate a PR. Next, you need to select which repository you wish to update (the base repo) and which repository contains the content that you wish to use to update the base (the head repo). In this example, you want to update earthlab-education/ea-bootcamp-hw-1-yourusername with commits in your fork /yourusername/ea-bootcamp-hw-1-yourusername. Base: the repository that will be updated; changes will be added to this repository. Head: the repository containing the changes that will be added to the base. One way to remember this is that the “head” is ahead of the “base”. So you must add from the head to the base. The above pull request configuration tells Github.com to update the base repository with contents from your forked repository, or the head repository. You can also click on the commit titles to see the specific changes in each commit. This screenshot shows the differences between the files on earthlab-education and jenp0277's fork of the repository. When showing line by line changes, the deletions will be highlighted in red and additions will be highlighted in green. Pull request diffs view can be changed between unified and split (arrow). If you are adding new commits to base repository (e.g. earthlab-education/ea-bootcamp-hw-1-yourusername), then the “Create Pull Request” button will be available. Click the green “Create Pull Request” button to start your pull request. Add a title and write a brief description of your changes. When you’re done with your message, click “Create Pull Request”. Pull request titles should be concise and descriptive of the content in the pull request. More detailed notes can be left in the comments box. Notice that when creating a new pull request, you will be automatically transferred to the Github.com site for the base repository. At this point, you are done with the pull request! In this case, you have submitted a pull request for Homework 1! Though you may see an active button for Merge Pull Request, this button is intended for the owner of the repository. They can review your pull request and then decide if/when to merge it into their original repository. Note that until the owner merges your pull request, all future commits that you make to your fork will continue to be added to the open pull request. You can also close a pull request on Github.com if you decide you are not ready to submit your files from your forked repository to the original repository. 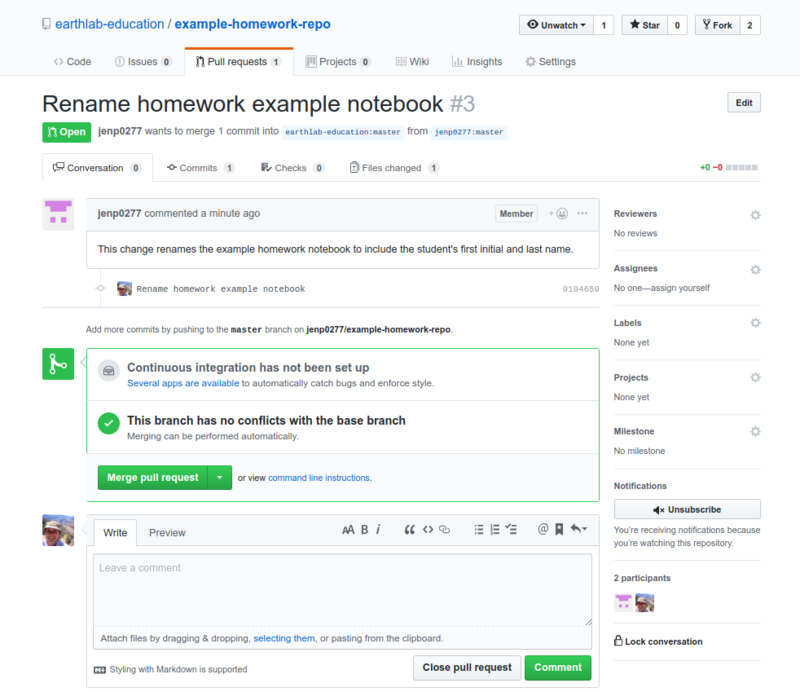 For example, the pull request you just created in this lesson can be closed if you have not yet completed Homework 1. 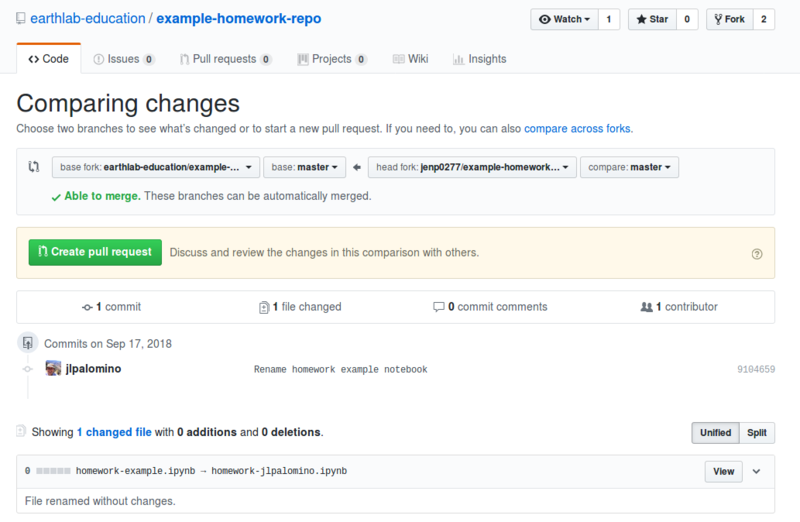 When you are ready to submit Homework 1, you can simply create a new pull request on Github.com following these same steps. To close a pull request, simply click on Close pull request button toward the bottom of the pull request page. Location of the Close pull request button on an example pull request from jenp0277 to earthlab-education. Congratulations! You know now how to submit Homework 1. Simply repeat the steps in this lesson when you are ready to submit your final Jupyter Notebook file for Homework 1.